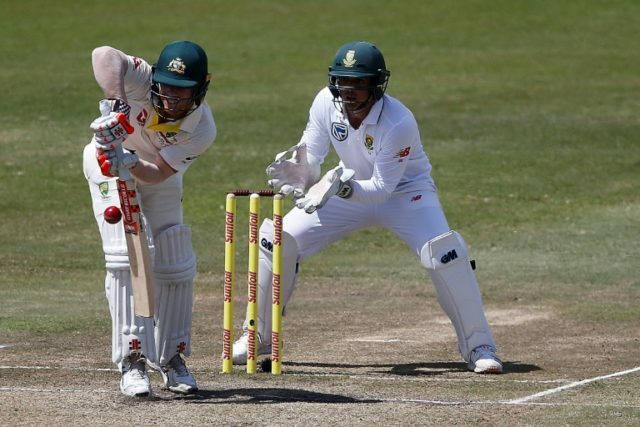 Port Elizabeth (South Africa) (AFP) – South African coach Ottis Gibson on Wednesday called for umpires in the second Test against Australia to “do their job” and defended Quinton de Kock against allegations of provoking an altercation with Australian vice-captain David Warner. Gibson also questioned what was meant in Australian assertions about not “crossing the line” with their behaviour. Warner was cleared to play in the second Test starting on Friday but was fined 75 percent of his match fee and given three demerit points for an incident captured on closed circuit television as the players climbed the stairs towards the dressing rooms at the start of the tea interval on the fourth day of the first Test in Durban on Sunday. Warner, who was charged with a level two offence, will be banned if he gets one more demerit point within the next year. De Kock was charged with a lesser level one offence but contested the charge, adding further spice to the second Test which starts in Port Elizabeth on Friday. He was, however, fined 25 percent of his match fee and given one demerit point. “Quinny wasn’t aggressive. You saw some footage and the footage showed Quinny walking up the stairs and somebody else being restrained, and then Quinny gets a level one. That doesn’t seem fair,” said Gibson. In response to comments by his Australian counterpart Darren Lehmann that both sides would “push the boundaries” with their on-field aggression but that they shouldn’t “cross the line”, Gibson asked how that line was defined. Although both teams have confirmed that there was verbal aggression on the field, the on-field umpires did not report anything, evoking scepticism from Gibson. “The match officials are there to do a job and to govern the game on the field, and off the field I guess. If they hear things on the field, they should clamp down on it. Former West Indies player Gibson said the great Windies teams of the past, with their battery of fast bowlers, had not needed to try to unsettle batsmen verbally. “They were aggressive with the ball and their body language and that’s what aggression is. When a batsman is trying to take his guard and people are standing around and saying whatever they want to say, I’m not sure that it’s necessary,” he said. The punishment of Warner followed a 15 percent fine and one demerit point imposed on Australian spin bowler Nathan Lyon for appearing to drop the ball on AB de Villiers after the batsman was run out in Durban.